Wilhelm Lanzky-Otto was born in 1909 to a musical family in Copenhagen. His father Frederic was an organist, singer and vocal coach, and his mother Anna was a pianist. At the age of 5, he began his formal piano studies with his mother and within a few years, the young Lanzky-Otto was studying the piano with Sophie Olsen, one of the leading piano teachers of the day in Copenhagen. In 1917, he began to play the violin as a second instrument and though he showed considerable talent and promise on that instrument as well, it was Wilhelm's intent to concentrate on the study of piano and music theory. Despite the urgings of his violin teachers, who believed that Wilhelm could have become a violin soloist, he entered the Royal Danish Conservatory in 1928 under a full scholarship as a student of piano. His introduction to the horn came in 1927. At that time, there was a great scarcity of horn players and an over-proliferation of violinists in Denmark. At the suggestion of his father, Wilhelm began considering the horn as a second instrument to the piano and was brought to Hans Sørensen, then Denmark's most prominent hornist who realized very quickly that here was a young man blessed with tremendous natural talent for the horn. Though Sørensen did not wish to create a situation in which there were more horn players than the market could sustain, he felt that such talent as this must be given the opportunity to play the horn and so took Lanzky-Otto on as one of his students. 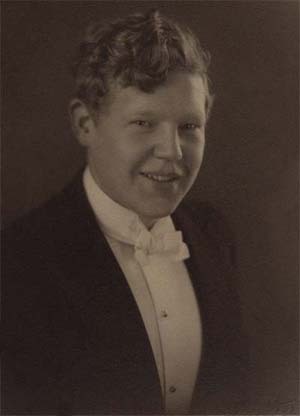 Two years later, in 1929, the same year that he left the conservatory, Wilhelm Lanzky-Otto began working as solo hornist in Copenhagen with the Tivolis Harmoniorkester and in 1930, he joined the Tivoli Concert Orchestra, which is now know as the Sjællands Symphony Orchestra, also as solo horn and there he stayed until 1936. But while he was working as a hornist, he did not consider this the start of a horn career. These were part time positions and their short 4 month seasons suited Wilhelm perfectly as they gave him an income and allowed him the rest of the year for study, which included a period in Paris studying the piano with Robert Casadesus during the first half of 1934. Lanzky-Ottos solo debut as a piano soloist was in February 1932 and his debut as horn soloist was in January 1936. In 1936, Wilhelm also took the position of solo horn with the Statsradiofoniens Orchestra, now known as the Danish National Radio Symphony, directed then by Fritz Busch and Nicolai Malko. Frequently, he appeared as soloist on the horn and piano, many times on the same concert! This unique activity he continued until the 1960's. With the death of Hans Sørensen in 1945, Lanzky-Otto began working as solo horn in the Royal Danish Opera Orchestra as well, the fifth generation of the Lanzky-Otto name to sit in that orchestra. Wilhelm also succeeded Sørensen as horn professor at the Royal Danish Conservatory. But, at the end of 1945, Lanzky-Otto was offered the position of piano instructor at the conservatory in Reykjavik. While this position meant a very high teaching load, he was also able to work as solo horn with the Iceland Symphony Orchestra. The years in Iceland would prove to be very rewarding for Wilhelm because at that time, far from being an isolated musical outpost, Reykjavik was one of the world's musical centers. This was the period before non stop international jet travel and all the soloists of the day had to make refueling stops in Iceland during flights between the American and European continents. For Lanzky-Otto, this meant regular contact with such luminaries of the era such as Rudolf Serkin, Reginald Kell and Adolph Busch. In 1951, Lanzky-Otto was asked to apply for the position of solo horn with the Gothenburg Symphony Orchestra. The high cost of flying in those days made an audition impossible, so Wilhelm sent an acetate of the second and third movements of the Saint Saens Morceau de Concert for Horn and Piano. With this recording and an accompanying photograph, he was engaged as solo hornist with the Gothenburg Symphony Orchestra and shortly there after he took the position of instructor in horn and piano at the Orchestra School in Gothenburg as well. Just as he had done in Copenhagen and Reykjavik, Wilhelm continued his practice of performing as soloist at the piano and horn during radio broadcasts and concert tours throughout Sweden. In 1956, he was asked to take the position of solo horn with the Royal Stockholm Philharmonic Orchestra, succeeding Axel Malm, who had been solo hornist with the orchestra since it's inception in 1914 and by the end of the year, he had succeeded Professor Malm at the Royal Conservatory as well. The introduction of the &QUOT;Lanzky school&QUOT; was a shattering development, which must have been a painful and bitter experience for many of the older generation of horn players. A whole tradition of horn playing was swept away. But the positive acceptance of Wilhelm by among others, Bertil Rindförs, the orchestra's Third Hornist, led to a kind and unproblematic reception of Wilhelm and later Ib. Wilhelm's style of playing was not unique, it was a continuation of the classic Danish horn tradition which in turn as far as recordings allow one to judge, was a continuation of the traditions one found in France up to Jean Devémy, In Austria up to Karl Stiegler and in Germany as a whole up to the 40's and 50's. But Lanzky-Otto's real legacy lies in his teaching abilities. His legendary talents as pianist were a great resource in horn teaching and he almost always conducted a horn lesson from the piano bench. He had a particular gift for working from the students own limitations and needs. He was able to set forth the boundaries of a particular style to a student while still allowing the student freedom to interpret within that style. He raised the standard of horn playing in Sweden to such a high standard that in 1962, Bengt Belfrage, one of his students, was chosen to play solo horn with the Berlin Philharmonic and Rolf Bengtsson won a position with the Chicago Symphony Orchestra in 1968, though he declined the position and remained in Sweden. Even today, two of Scandinavia's most well known artists of the horn, Frøydis Ree Wekre and Sören Hermansson, were students of Wilhelm. In 1978 Wilhelm was named a distinguished member of the International Horn Society. Lanzky-Otto's experience taught him that an orchestra's solo hornist should never become indispensable. He felt that everyone in the section should be prepared and able to play principal horn. To create such a situation, he felt that if a young player had the qualities and showed the ambition to be a principal horn, he should be allowed to play the large works before he became old enough to respect the repertoire too much. Wilhelm felt that everyone in the section benefited from this, even the regular solo hornist, who can take time for other interests such as solo work, or can sit in the section and be reminded of the responsibilities of being one of the led instead of being the leader. Even today, one never really knows &QUOT;who's on first&QUOT; in the Royal Philharmonic Orchestra of Stockholm.